Planned Parenthood of Southwest Ohio CEO Jerry Lawson with Ellen Doyne, Stephanie Dodd, Sher’rie Brown, Marlene Ostrow, Mauri Willis, Andrea Herzig and Penny Pensak. The National Council of Jewish Women Cincinnati Fund is closing after 120 years of local service. The group cited recruiting challenges and a desire to merge with its national organization as reasons for the closure. 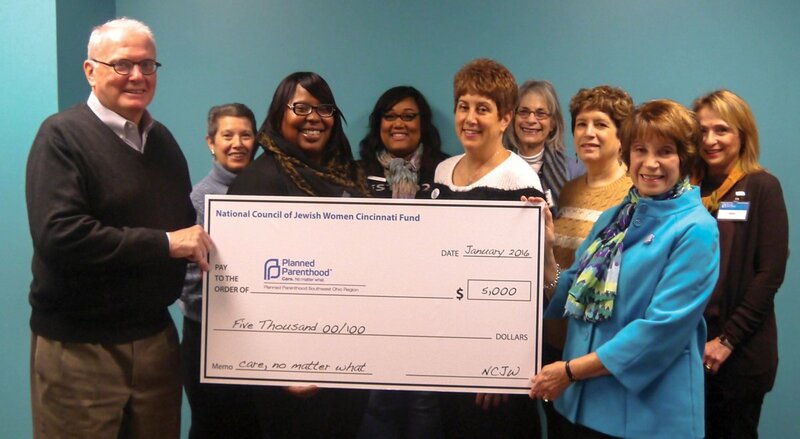 NCJW awarded its final grant of $5,000 to Planned Parenthood Southwest Ohio Region in a small ceremony Jan. 8 at the Planned Parenthood Mt. Auburn Health Center. “We wanted our last local gift to be as meaningful as possible. With the recent attacks on Planned Parenthood’s mission to provide quality reproductive healthcare, we could not think of more deserving group,” said Andrea Herzig, NCJW Cincinnati fund president.